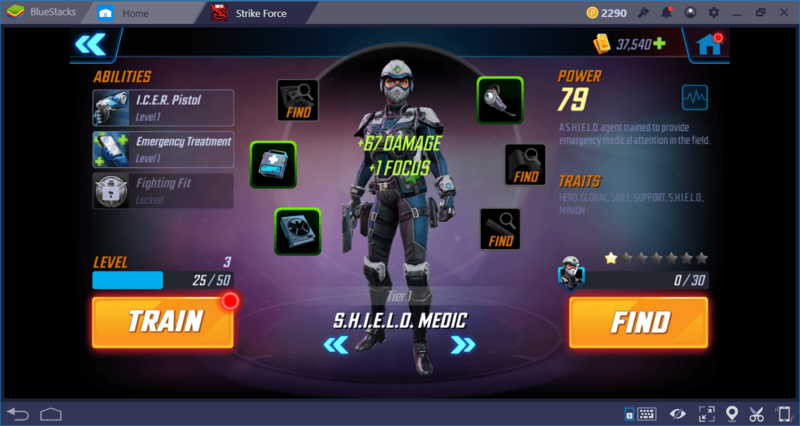 There are so many heroes (and villains) in MARVEL Strike Force that you may be having trouble in deciding which ones to pick and which ones to level. Moreover, not only your heroes, you need to level “yourself” too. Some features in the game become available only after you reach a certain level. 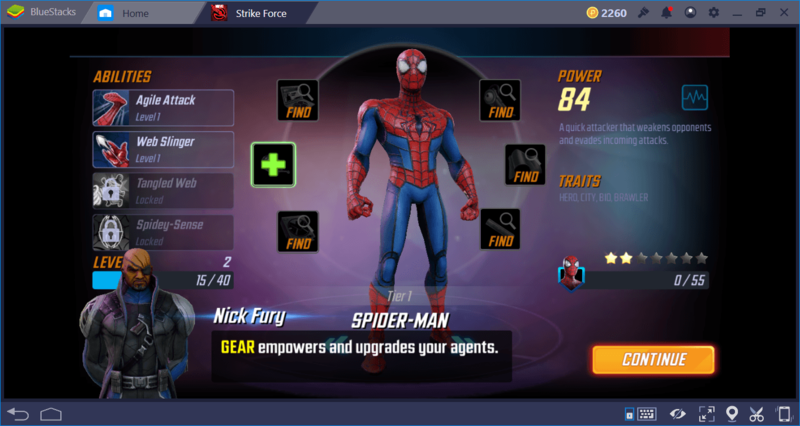 For this reason, it is important to complete the leveling process as quickly and efficiently as possible to be able to use all the features that MARVEL Strike Force offers. In this guide, we will tell you how to do this for both your heroes and yourself. 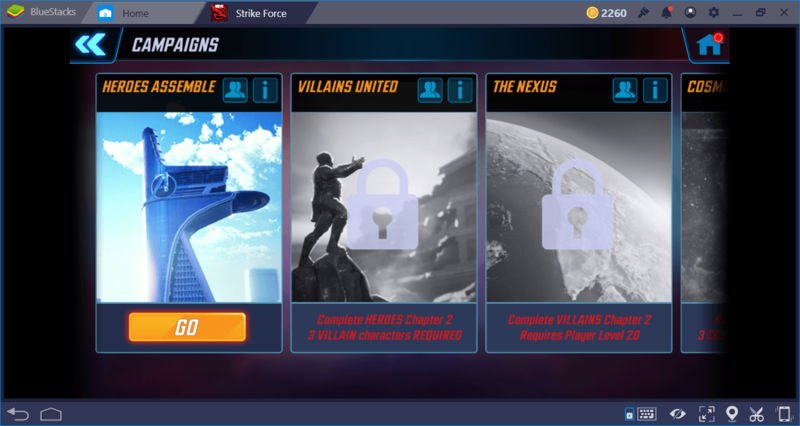 As mentioned above, MARVEL Strike Force has two different level systems: Your level as the commander and the level of your characters. You have to upgrade each one separately. Experience (XP) points are the only source of this process: You need to keep collecting them to gain levels. By raising your own level, you can unlock additional features of the game. For example, if you want to try your chances in PvP battles, you have to be level 30. Your characters also gain new abilities as they level up and become even more powerful. If you want to join the alliance raids, you need a team of strongest heroes. In short, both you and your characters have to gain levels separately. You can see what your current level is on the “player profile” screen. Campaign Missions: Scenario tasks are your primary XP resource. The most XP points will come from completing campaign missions. It is important that you progress quickly in scenario tasks, as all the other features of the game depend on it. 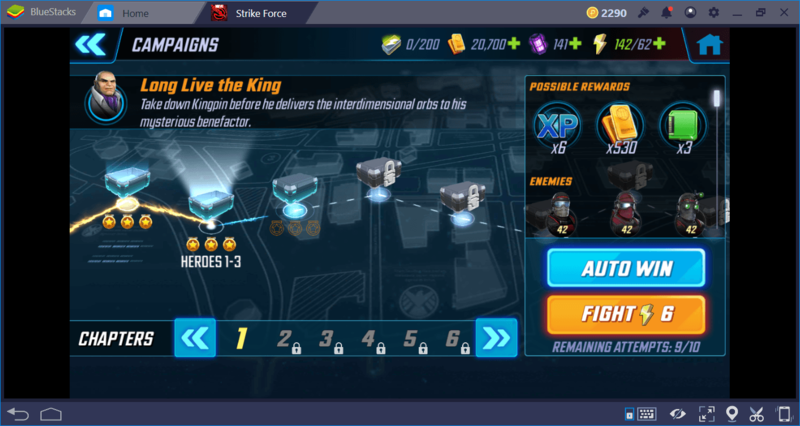 For example, “events” feature, which is an additional XP source, does not become active until you reach level 8. So try to complete scenario tasks as quickly as possible. Moreover, you can also learn the story of the game by doing this. 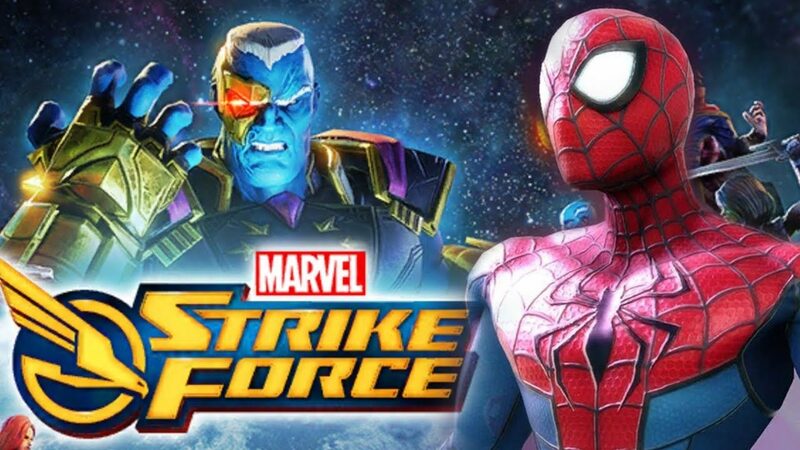 Daily Challenges & Events: MARVEL Strike Force gives you specific goals to complete each day. For example, you can play a certain number of campaign missions or collect a certain amount of orbs. When you complete these goals, you will earn additional XP points. Let’s give you a tip about getting XP points faster than the methods mentioned above: Auto-Win. You can replay every chapter and episode you have completed. Re-playing a chapter or episode will still award you XP points. 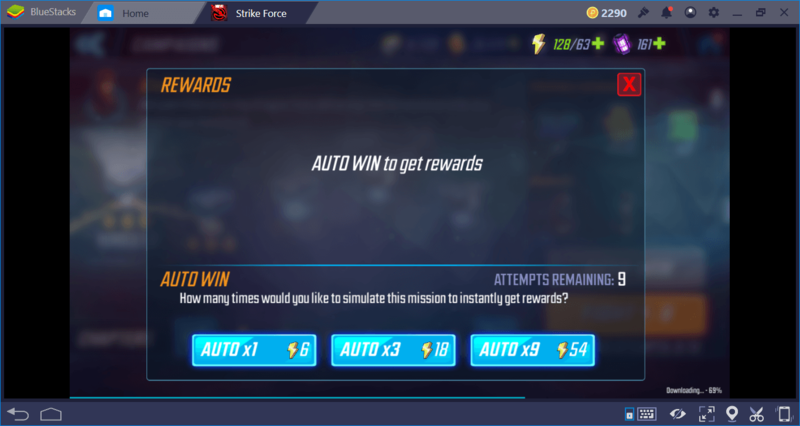 However, if you do not want to lose time, you can get all the mission awards (including XP) within a few seconds by using the “auto-win” option. With this option, it is possible to complete each chapter or episode you previously completed up to 10 times, every day. Because you will get XP points every time, this feature is an important resource: You can gain 4 to 5 levels in less than a minute. However, using this feature requires you to pay with energy every time. You cannot use the Auto-Win feature consistently because energy is one of the most valuable currencies in the game. However, we recommend that you still use this feature at least until you reach level 8: The “events” feature will become active at this level and provide you with an additional XP source. In a nutshell, there are two ways to upgrade your own level: The fast way requires you to use energy points. The slow way takes much longer, but if you play regularly, you can reach your goals eventually for free. To give you an idea, you need 17,500 XP to reach level 60, which is the last commander level in the game. Your activities will award your characters with XP points too. For example, by completing campaign missions and daily challenges, they can also level up. In fact, they level up faster than you, and you can use all of the advice we give above for your characters too. However, there are additional ways to level your characters. For example, you can use “equipment discovery tasks”. Open the screen of a hero: You will see some of the slots display a “find” sign. This means that the slot is empty. 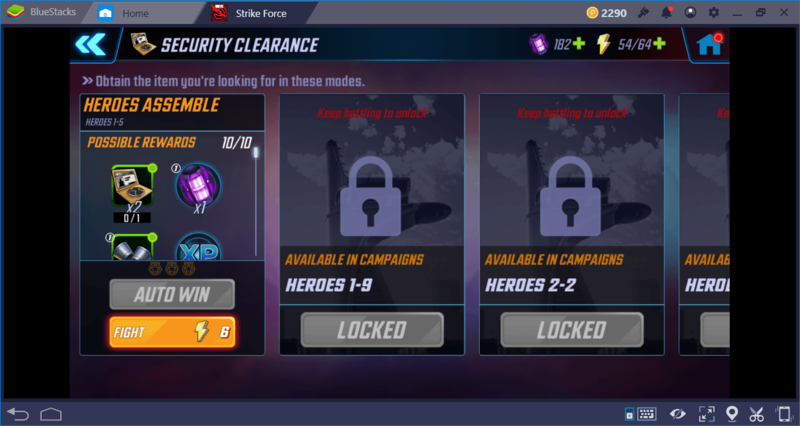 Now, you can keep doing campaign missions and hope to find a suitable equipment for that slot, or you can try to “search” for that equipment specifically. If you click on any of these slots, another screen will open up showing the tasks you can complete to find the equipment that can be used for that slot. As you can see, the “Auto-Win” option is also available for these tasks too. So you can quickly complete them and gain both levels and equipment. However, the easiest way to level up your characters is to “train” them. Re-open the character screen of a hero, you will see a button at the lower left corner that says “train”. When you click on this button, you will see that you can level your characters by spending gold. The tasks and activities you complete award you “training documentation” too. By giving these documents to your characters and spending gold each time, you can quickly level them up. 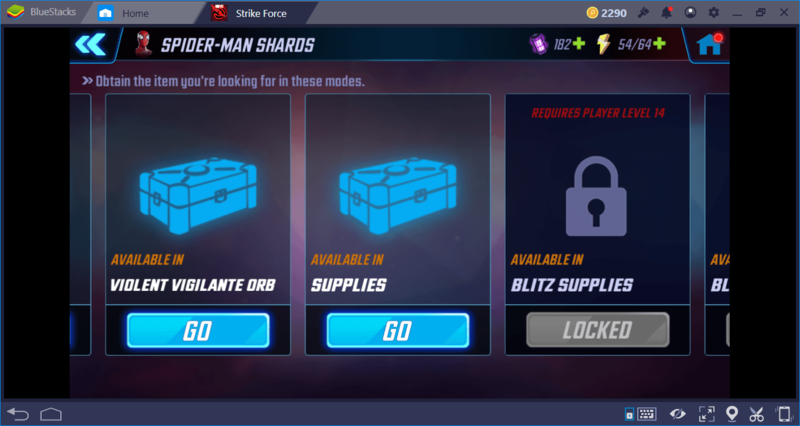 For example, we have 8 documentations in the following screenshot and we can give them to Spider-Man to quickly reach level 3. This screenshot is from the early stages of the game and you can see that we already have than 22,000 gold. Using this method costs 315 gold. In other words, we can easily afford it. When Spider-Man gains a new level, all his stats will rise and he will become more useful during combat. He will even gain new skills. In other words, it is easier and faster to level up your characters. But there is something that is hard for them too: Gaining new ranks. Each character’s rank can be increased to 7 stars. Higher rankings allow your characters to be much stronger, gain extra skills and use, for example, high-end equipment. You can see the rank of your characters from the stars right below them. 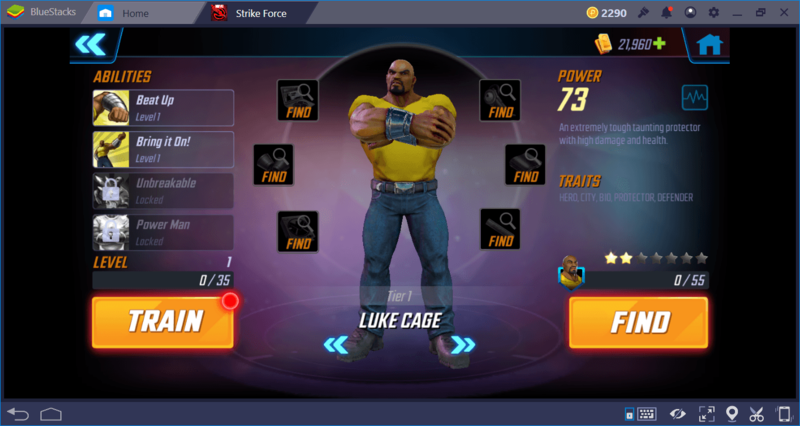 For example, in the following screenshot, Luke Cage is in rank 3. 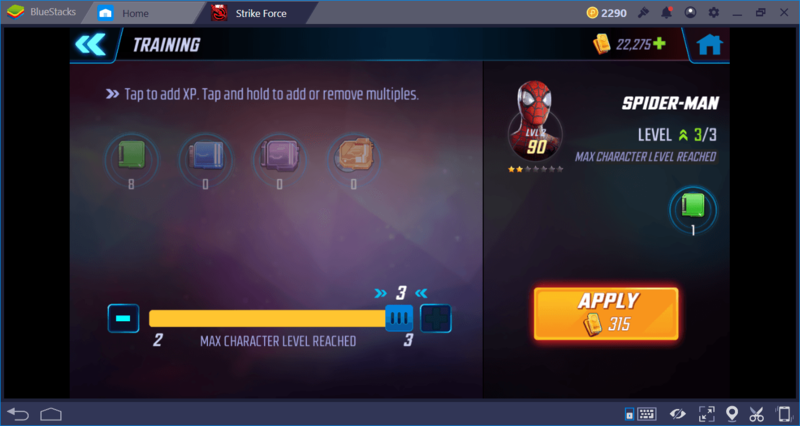 You need a total of 810 shards to upgrade each character to rank 7, so this is not something you can complete anytime soon. We recommend concentrating on a few specific characters and just collecting their shards. Because collecting the shards of all the characters in the roster can take (literally) a couple years. 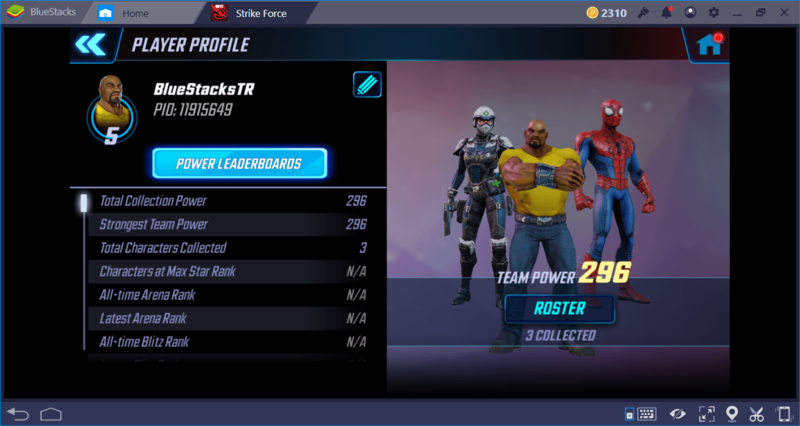 Now you are ready to level your heroes and lead them on the battlefield: Remember that BlueStacks lets you use keyboard and mouse to play MARVEL Strike Force, which makes your job even easier. We wish you good luck on this exciting adventure in the MARVEL universe: Remember us when you defeat Ultimus!